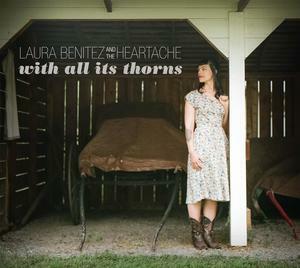 If there’s one thing to be said about “with all its thorns,” the third release from Laura Benitez and the Heartache, it’s that she’s taken her gift of singing it like she means it and notched it up, again. It’s her genuineness that sets her apart, which is no small feat when dealing with well-traveled country roads like love, heartbreak and DIY therapy. Along with tears in beer songs, this release comes with a stronger sense of spirit, a variety of themes, and sabor de Tejano. The opening track, “Something Better than a Broken Heart,” is indeed genuine. It’s good that the band added some country bop to this song. Had she recorded it solo with an acoustic guitar, the pain might well be more than the average listener could bear. Wisely, it’s followed by “Easier Things to Do,” which confesses that songs about deep love really are harder to write about than the heartbreakers, which provides both a tune to hum and a paradox to ponder. “Our Remember Whens” beams with optimism that, together with “Easier Things to Do,” almost seems like a listener set-up for the fourth track, “In Red,” a murder ballad of the first order. In this homicide it’s the gal’s ragin’ lead that bores right thru the two-timin’ rat’s, low-down, lyin’, cheatin’, no good, double-dealin’, and don’t forget worthless, heart!!! Now this is singing it like you mean it. Following that grisly affair is one of the most beautiful Tejano ballads you’re likely to hear. Lydia Mendoza would be proud of “Almost the Right One (Casi mi Cielo),” a journey into real love that hits you right in the old corazón. So, if songs about true love are challenging to sing, what about alcohol-fueled lust songs? “Whiskey Makes Me Love You” gets the full band treatment on the CD; here is a duo version to enjoy. Four more tracks round out the CD and only one, “What Does It Matter?” seems like an afterthought. Its inclusion is of little consequence given that the other ten songs offer more than enough to keep them rattling around inside your head. Samples are on this seven-minute HWS mix, so let the rattle begin.